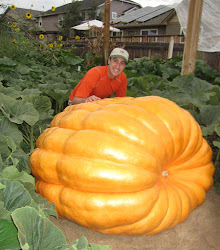 Haven't put a tape measure on the 1685 pumpkin "Cujoe" in two weeks. Wanted to see if it is still growing. It does appear to be growing. An average of 6 pounds per day. Which is relatively slow at this point, so it may not grow much longer, but the weigh-off I'm taking it to isn't for another month, so hopefully it will continue to chug along for another couple of weeks. Right now it is only 23lbs (estimated weight) behind Jumbo. Jumbo is still growing according the last measurement, but just verily. I'm guessing it will stop growing this next week if it hasn't already. This morning I did a small foliar application of potassium and humic acid on the leaves. I then did a soil application of humic acid, zinc and boron. This application was micro and probably a month late. Because of my sandy soil things like zinc are naturally deficient because it leaches out easily. Should have put this application down the beginning of August, but probably better late than never. At this point the goal will be to shade the pumpkins and keep them dry and relatively cool once they stop growing so we can maintain the weight and keep them from rotting. I'll keep them on the vine right up until the weigh-offs.